Discuss your moves for the big dance. Discuss your team, strategy, players, etc. in this post. Offer up constructive comments if you want questions answered yourself! Be a giver, not just a taker! This is a great community and we want it to stay that way. We love banter as much as the next person, just keep it clean! Anyone considering trading out the pig? It’s not the worst idea. However, I probably would want to get Greene to someone better than Shiel. 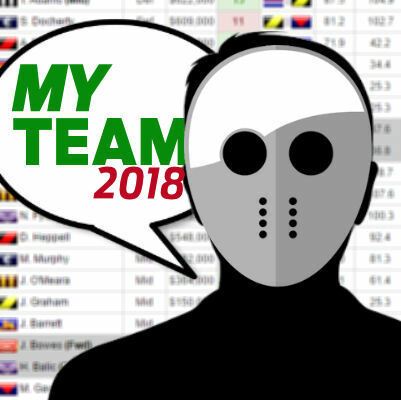 Need a bit of help with my team, not too sure what trade will maximise my points for my grand final. 1) Ahern –> $170k mid + Sier –> Dunkley/Menegola (bench either Heeney, McLean or Wingard). Which one? Or is there better options? So Sier to Dunkley and just bench McLean? thanks, is he better than gibbs? I’m going Grundy this week.. up against Darcy unless Sandi comes back which I doubt? Flip a coin and go with your gut feeling. I’m in the same situation (but with Wingard instead of Rocky), and it’s near impossible to tell which one will do better. I traded Heeney out for Menegola two weeks ago. I’m trading Rocky to Danger this week. But yeh Mclean is not going to good either. Wingard or Mclean to trade to Menegola?? Witherden to Simpson, and Shuey to Sidebottom. Heeney or Mclean to Dunkley? 1) Who do I trade Witherden for??? 2) Shoukd I trade Zorko? If so, who to? yeah that could work, I’m getting Clayton as he is free of tag. In my league GF so thinking about trading Titch but really not sure. ANyone actually doing it? Just go 1. Awesome trades and Mitchell will still be decent, just don’t captain him if you’re not confident. Should I trade out rocky or McLean for Dunkley? At the moment, I’m going rocky for dunkley. Mclean would have to give you more than rocky has been putting out. Seb Ross or Taylor Adams or Ablett? who to trade out of phillips, pendlebury and redden, baring in mind fixtures and their price. I have 81k in the bank. Best forward to trade for Heeney for this week’s gf matchups. Price isn’t an issue, but just dont think the Port Adelaide boys will go big enough against Essendon to go the obvious Westhoff/Wingard combo etc. Ranked 75 last round but Heeney let me down. Which uber-premium should I trade in from Ahern? Thinking Danger since he plays GC and he is in hella good form but Ablett scored 119 against them in Rd 11. Price is no biggie but so many options to decide from. Upgrading Wingard at M8 and have 654k..
Got 0.5m in the bank. Looking to move on Jota this week to Mkhi, and my current plan for the week after is to use my wildcard, and potentially drop Salah if Hazard plays 90 mins this week. Thinking Mane could potentially eclipse Salah in points this season, and Hazard is just a gun. That said this is looking like my team post gameweek 3/4. Have the other kids kicked you out of their play group? Is that why you’re so intent on crashing this one? Or maybe your afl fantasy team crashed and burned and you’ve thrown down your ball but can’t bear to go home? best midfielder under 640K? has the likes of sidebottom, dusty, taranto, sloane, ed curnow???? Hmm boot Neale or Gibbs for Ross? How will Gibbs go vs Carlton? Option 1. And sub 700k can be Gibbs. Jack Steven named but injured his knee late last week against Hawthorn? Stupid to get Hawkins in over Dunkley? Are there any other options I could look at? Fellas pls give me some advice ! im stressing. I really like #1, but there was some whispers about BUddy early this week…… Thanks! I’d go option 5. Sidey should have a good game against the Dockers and Dunkley should be good for a ton. Wouldn’t go option purely for the uncertainty of Buddy being a late out. If you got bench cover go for it. okay thanks mate. agree with Sidey then? Can I please have some help? I am stressing! Somehow managed to weasel my way into the grand final in a paid league, and cant set my mind on trades. Should I just swap to one the guy I’m facing has to cancel them out or try the old no guys no glory and grab someone random?